If you’re like many of us, you care about your pets – even the organisms in your aquarium! These lights have been made especially for plants and corals, which have been gaining in popularity. These LED aquarium lights are also very suitable for African cichlids, if you happen to have any of those in your aquariums as well. These LED lights are designed to provide the optimum temperature and lighting conditions for your aquatic plants. These LED lights also serve to give a special aesthetic appeal to any corals and other aquatic organisms, freshwater fish or saltwater fish that live in your aquarium. How Does LED Aquarium Lighting Work? There is a huge variety of LED aquarium lights available on the market today. You might get quite confused initially, but if you know a few good questions to ask yourself then you are almost sorted. The first thing that you need to consider in selecting the most suitable LED lighting is the size of your aquarium. Depending on the size of your aquarium, the type of LED you choose will vary. The larger your aquarium is, the more light you will need. If you have a very large aquarium, and need a lot of space lighted up, you will need an LED whose light coverage is vast and its intensity widespread. The second important factor is the kind of plant life that you have in your aquarium. If your plants and corals are in their growing phase, you will need a different level of light intensity than you will at other stages of their life cycles. Different kinds of plants will have different light requirements, and there are different LED systems for each. Thus, you need to choose an appropriate one for your aquarium. When exploring the options available for you aquarium LED system, you will discover you have a wide range of intensities and colored spectrums to choose from. This will be useful if you need to provide the optimum lighting levels and types for a wide range of plants and cater to all of them in a variety of growing phases, or in the case of corals their specific ideal living conditions. The different intensities and different colors of light are each suitable for various plants and their individual growth phases. The last and the most important factor is your budget. There is absolutely no need to worry, as the range of LED light system prices is huge, so everyone can find what they need within their budget. Each has a different set of features, so you can choose a system with only the ones you want and not have to pay for bells and whistles that you don’t need. LED lights provide wonderful efficient functionality for your aquarium at a price you will find very affordable. The best part is that the range of features and prices makes this excellent product available to everyone in a way that fits into their budget. 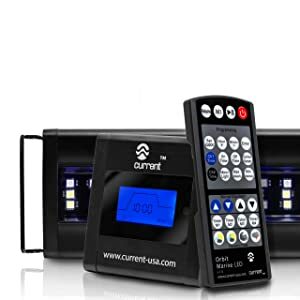 Some of the leading aquarium lighting systems available in the 2019 market are listed below. Each one of them has its own benefits and its own way in which it might potentially be the best LED available today. You have to consider your needs, criteria and make your choice judiciously. This LED has been rated as one of the best because of its amazing features. This full-spectrum LED provides 6500K ultra-bright illumination. The sleek design is what makes it stand out from the crowd. This energy-efficient LED is available at an amazing price. Some of the best things about this LED are that it is lightweight and user-friendly. It is easy to install and provides the perfect lighting for your aquarium. An LED system has to perform exceptionally well to get onto a list of the very best LED lights. This particular LED allows you to take the greatest possible care of your plant, by taking advantage of the different intensities of light and actually figuring out the different growth phases of plants, thus creating the ideal environment. Despite having a multitude of features, this LED comes at a very reasonable price. You will be amazed at all the benefits this particular LED has to offer. The design of this LED system is such that it can very easily illuminate a whole standard size aquarium without the least worry about producing heat and increasing the temperature inside the aquarium. 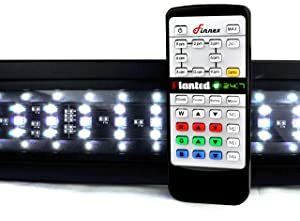 This LED system is available at a very affordable price. The size of the LED varies from 18 to 60 inches, and it is pretty easy to handle. This LED also provides an easy color adjustment feature for your convenience. The VIPARSPECTRA is a full spectrum aquarium light with a special design. The different colored lights are arranged in a criss-cross style among the white bulbs. Even though the design seems random, the company assured their users that this layout is researched and approved by thousands of Reef Central members to maximize the health and growth of aquatic plants and coral reefs in your tanks. By having full spectrum of lights, providing many different light waves, this fixture is suitable and healthy for all photosynthetic corals, helping them grow better and maintain a vibrant color. The light bulbs are grouped into different channels. Each can be fully programmed. There are built-in timers in each channel, allowing you to program the intensity, and on and off time, for each separate light channel. This feature makes this fixture almost completely customizable. Different types of fish require different intensities and amounts of light at various times of the day. Having this programmable timer function means that you don’t have to rush back from work or wake up at night to adjust the light, and you’ll never forget to dim the lights for your fish. Unlike most others, this LED system is completely automated—it can figure out the temperature and the actual stage of the plant’s growth. With this information, it can vary the intensities as per requirement and make use of the different colors and wavelengths of light to optimize the growth of the organisms living in your aquarium. The hands-free mode can be used here, and the best part is that the LEDs can be customized and used as dim light instead of the usually brilliantly bright ones. The fixtures available with these LEDs are very easy to attach to your aquarium and strong enough to hold the LED solidly in place. Thus, this LED makes the list of the very best LED lights for planted tank. 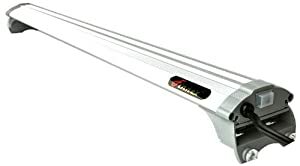 This light has a slim design, in the shape of a long and narrow bar. With the LED light bulbs spread across 120 degrees, this unit can light up the largest aquariums. The LED bulbs used in this fixture are top notch in quality. They can last at least 40,000 hours of constant use. The circuit boards are built with high-quality aluminum to help keep the lights cool, which will make the bulbs last even longer. This fixture is designed with a series of LED light bulbs to promote marine refugium and growth. Unlike many other fixtures, which arrange their bulbs in one spot for intense lighting effects, this fixture arranges the bulbs in a more evenly spaced manner. Thanks to this, the lighting covers the aquarium more evenly and the intensity of the lighting is not too strong. This fixture provides full spectrum light. It includes a wide range of colored LED lights to ensure the health and growth of your fish and aquatic plants in the tank. The fixture comes with two lighting modes, daylight, and moonlight. The moonlight feature can be turned on via remote so you can set the moonlight lighting for your aquarium at night. Is your aquarium not as lively and attractive looking as you would like? It could be simply because you have not used the right aquarium light. You could start having the best aquarium on the block if you switch to this model of aquarium lighting today. It is designed to help you achieve an appealing look for your aquarium, but keep the cost low. Making your aquarium look better just got cheaper. It is not just about lighting up your aquarium— it can also help keep your energy bill low. The LED lights this model uses are selected because of their low energy consumption levels. This is one of the many reasons many people love this model for lighting up their aquariums. The model still comes with an amazingly sleek and contemporary design. It fits easily in a wide variety of aquarium sizes. 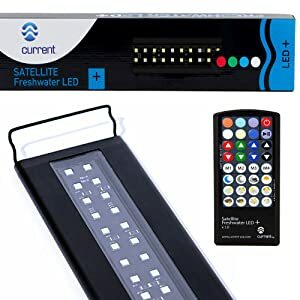 These LEDs are long-lasting, so you do not have to worry about having to replace the different bulbs every few months like you do in older models of aquarium lighting. There is no doubt that among the many LED lights, this is one of the best. You do not become the best by just coming from a top brand, but rather by delivering on performance. This model has some exceptional aspects, as we will get to see. The first thing you will like about this model is its brightness. It is a super-bright light. It will always illuminate every corner of your fish tank with ease. It might be bright, but it is also energy efficient. Some lights use a lot of energy to deliver this level of brightness, but this one does not. That’s because it uses LED lights that produce amazing brightness with low, economical energy use. They can also last a very long time, so you do not need to worry about replacing the light any time soon. The adjustable metal bracket makes this model a great choice for a variety of aquarium sizes. The manufacturer recommends that you install it on tanks ranging from 46 inches to 54 inches. The large aquariums now have a light that fits them with ease. There are two lighting modes built into this model. The white and blue LEDs are good for daylight, while the blue LEDs alone will be good for nighttime. If you own a saltwater aquarium, you can make it even better with just a few easy upgrades. In addition, you can be sure that the model will keep looking great even over time. The manufacturer has integrated high-powered LED chips that deliver great wide spectrum lighting. Such spectrum is important to deliver the right type of light wavelengths needed to keep your marine life healthy and thriving. This will ultimately result in better growth and more vibrant colors. The dome optics enable this model to spread the light evenly throughout the entire aquarium. This ensures that all marine life in the aquarium can get the light they need to grow. For easier use, the manufacturer made it easily programmable. 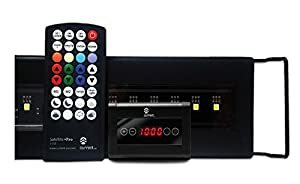 You can set it to turn on or off at your specified hours, while the model can still simulate any times of the day you choose, such as moonlight, sunrise, and sunset. The various dynamic effects available allow you to choose an effect that will provide just the look you are going for. You can easily switch from one effect to another, depending on your personal preference. 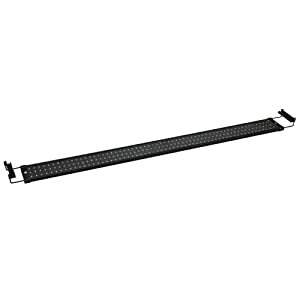 This fixture has a long and narrow shape, making it easy to fit into any aquarium. The fixture also includes an extendable bracket, making it fit different sizes of aquariums. Because of the powerful light effects of this model, as long as the extendable bracket can reach the sides of the tanks, the lights on this fixture can effectively cover all the areas that the bracket can extend to. The LED light bulbs are highly efficient and low energy. Since aquarium lights are turned on almost all the time, the energy-saving feature of these light bulbs will help you save quite a bit on your electric bills. Unlike other LED fixtures, when one of the LED lights on this model is broken the rest of the LEDs are unaffected and work normally. This fixture has full spectrum light, which is suitable for any types of fish, aquatic plants, and coral reefs. It comes with three optional control modes for the lights: all lights on, only blue LEDs on, and all lights off. The “all light option” is for daytime and the blue LEDs are for nighttime, giving a moonlight effect to the water. This model is better in every way if you have checked out other models before it. It has been improved to make sure that it can deliver more light, better color rendition, and better control features. It has been designed for freshwater aquariums. The best part is that you can adjust the full spectrum of the light so that the plant growth in the aquarium is better. Even when you adjust the light, it emits the vivid colors and brilliant shimmer effects that you have always wanted. It has an incredible control that is important for making sure that you get to enjoy the performance all the time. You can dim to simulate sunset or ramp up to simulate sunrise. This is crucial for those who want to have a colorful aquarium. You get to experience easy programming with a wireless IR remote or the touch keypad. You will enjoy being able to control the light easily from the comfort of your chair. The high output of 6500K white LEDs combined should be perfect for nearly anyone’s needs, looking great and providing as much light as the aquarium life requires. You’ll appreciate the use of the SMD LED technology in making this model, as it ensures durable bulbs that will not fail when you need them the most. 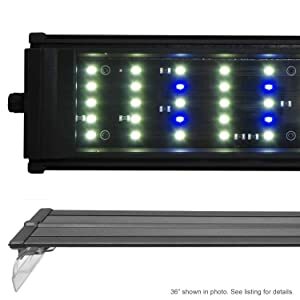 This LED model is available at a very affordable price and, hence, this could be listed as the tenth, the last best LED aquarium light in this list. LED aquarium lighting is basically an array of small LED lights arranged in a particular order to produce a bright light, having different intensities and different color options as well. The arrangement of the LEDs in an LED light is as simple as its working. Some of you might be a little more inquisitive about these LED lights and wish to know more about them. In that case, the first question that comes to mind is: How do these LED lights work? It is quite simple. These LED lights are basically some diodes. When these diodes are connected to a source of electricity, the electrons in them are converted into photons, and these photons are the packets of energy that we generally perceive as bright light, or light of a particular intensity or of a particular color or wavelength. 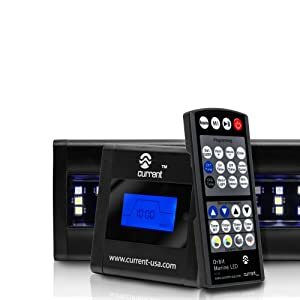 These lights of different wavelengths are connected together in a series, and these miniature lights together give a brilliant shine to your aquarium. They can be used to light it as well as provide an appropriate atmosphere for your plants and corals, including African cichlids. There is a huge amount of research and scientific planning behind the preparation of these LEDs. They work for long durations and save a lot of energy, in comparison to all other types of lighting. If lighting is the key factor for you, and you can afford to spend a few bucks, LED lights are something that you should definitely opt for and let go of all other kinds of lights. LED models are very affordable, yet they provide awesome service to the user for a considerable period of time. LED lights are extremely energy efficient and capable of saving as much as 10% of the total energy. They are cost-effective and an excellent value for your money. The lifespan of each LED is pretty high compared to all other lighting systems available in the market these days. LED lights are bright and attractive. The good quality LED lights can produce light of different intensities and colors, which in turn produces an optimum ambiance for the aquatic growth in your aquarium, whatever its kind and stage of growth. These lights are not just user-friendly; they are environment-friendly as well. They do not produce any toxic gasses in the process of lighting, thus keeping the general environment and the environment of the aquarium clean and non-toxic. These lights have been made as water-resistant and compact as possible, making them perfect for use as an aquarium light. Some automated LEDs also have the ability to figure out the different growth phases of the plants in your aquarium, and can adjust themselves accordingly and produce intensities of only the required wavelength and color. A number of small LEDs form the whole unit, hence there is no chance that the whole gadget will stop working at the same time. There are a few minor things lacking in the LED aquarium lights as well, but they can be overlooked if you take into account the immense benefits these lights have to offer. LED lights are currently the best lighting option available if you wish to grow plants and maintain corals and similar organisms in the aquarium environment. So what are you waiting for? Skim the market and select the best LED lights for your aquarium and the most suitable LED for your needs from the range of LEDs available today. If you have a Reef Tank, choosing the best LED lights for reef tank here. 1. Are LED lights good for growing aquarium plants? The light emitted by the bulbs is important for the growth of plants in an aquarium. You will, however, have to choose wisely based on the intensity of the light you are likely to get with the LED light. Before, it would have been easy to choose between primary colors, which were often sufficient for a number of aquarium plants, but that is not the case right now. You will need to do more research to understand which light would be effective for your plants. Most manufacturers will have this kind of information on the product label. 2. How does the color of light affect the growth of plants? You can expect that the LED lights will emit a spectrum of light, which contains the visible and non-visible colors of the spectrum. It is important to identify whether or not the light will contain the right type of light important for the growth of the plants. In such a case, you need enough bright light essential for photosynthesis. The blue and red zones are part of the visible zone that is important to the plants. Between these zones, you can expect to find many other colors that are important for the photosynthesis needed for plant growth. 3. Will aquarium plants grow under LED lights? Yes, the aquarium plants can grow under the LED lights, provided that you choose them correctly. Not all types of light will provide enough or within what the plants need for photosynthesis. You can check out the type of spectrum that you get from the LED light before making a decision. For a spectrum that can deliver a blue and red zone, that should be enough to generate enough light to be beneficial to the aquarium plants. 4. What light should I use for my aquarium? When it comes to choosing an LED light, it is always a matter of personal preference. Not all people would love a certain color. The best way would be comparing the different models that are available on the market today before making that decision. From the comparisons, you will find lights with fixed spectrums and others that come with variable spectrums. Choosing the one with variable lighting should make it easy for you to change the color whenever you feel that one output has been around for a longer time. 5. Why are my aquarium plants dying? There are a number of things that can actually lead to the aquarium plants dying. The most common would be that you bought the wrong plants. With the aquarium plants, you do not just buy any plant and think it can survive as an aquarium plant. Also, not all aquarium plants would survive under both the freshwater and saltwater conditions. Another thing would be the growth habits and light requirements. Some of the aquarium plants will need special lighting so that they can keep growing just the way you want. Whenever you are buying the LED lighting, make sure it can deliver the right type of light needed by these plants to keep them growing. 6. When should I turn off the aquarium light? The aquarium lighting service helps a lot in making the tank have the best appeal when looking at it. However, there is the need to have a balance of just how much lighting you can give to the aquarium ecosystem. The lighting is supposed to mimic the pet’s natural environment, so it is important to have some darkness at times. Whenever you have the lighting on, the fish will always be active and the darkness will make it easier for them to sleep. Deciding on the number of hours the light is supposed to be on can depend on the type of fish you are keeping in the aquarium. Most of the time, having 12 hours of light and 12 of darkness should be a perfect balance. 7. How to hang aquarium LED lights? You can mount the LED lights based on the mounting options. Some of the lights might need a suspension mount, while others might be mounted directly onto the aquarium. Even before you buy them, you should check the mounting options available to make sure they will work for your tank. Some of the mounting options might create the best aesthetic looks for your aquarium. For the hanging process, simply follow the instructions given by your manufacturer. This should be over before you know it. 8. How high to hang LED aquarium lights? How high you mount the LED lights will depend on a number of factors, such as the room available above the aquarium and the different materials available for handling the lights. Take the time to understand the best height for mounting based on the LED light brand. 9. How to dim LED aquarium lights? You will find that many aquariums come with different control options. This is to help with choosing the right type of settings that will work great for your case. Whenever you want to dim the lights, you should simply use the controls to dim the light to the brightness that you want. Other LED lights come with a remote control option, so you can dim the lights from the comfort of your couch. 10. How to make underwater LED lights for aquarium? When it comes to making this type of LED lights, you will need a number of materials, which can be found easily at an electrical store or online. You, however, need to get a tutorial that will give you the steps necessary to make the decision. The best place to find tutorials to achieve such a project would be YouTube. Many people who have used the tutorials end up making their projects successful. 11. How to convert aquarium light to LED? It is common that your aquarium light might not be pleasant, and in this case, there is always the option of changing to LED for more benefits. The first step would be identifying what makes the best LED for you, so that you can choose correctly. This could be based on the amount of energy that the lights will consume and the spectrum to expect, among many other things. 12. How to set up LED aquarium lights? Depending on your LED type, the setup can be easy or tough for some people. What is important is to always make sure you get it right the first time. Poor setup can lead to accidents, such as electrocution of the fish in the aquarium. Manufacturers today are great, as they give you a detailed setup process in the manual with diagrams. You simply need to follow the diagrams to end up with the correct setup in no time. 13. How to wire LED aquarium lights? The guide to wiring that LED aquarium light will be given by the manufacturer in the manual. Not all lights will have a standard method. Manufacturers today also often offer video guides on their websites or YouTube channel so that you can have an easy time wiring the aquarium light. Because you are dealing with electrical components, the wiring should be done carefully. In the event you feel that you are not good with the wiring, you can always call in a technician to help with the whole process. 14. How to use LED aquarium light? Most of the time, you will find that the LED aquarium light is for lighting up the whole aquarium and giving it a new, different look. Just having the normal look can sometimes be boring. The LED light will bring a different look that anyone would love to see. With the option that you can always tweak around the color of the spectrum, it makes it even better for daily use of the LED lighting. Another use would be helping the plants in the aquarium make food by photosynthesis. Without enough light, these plants are likely to die because of lack of food. That will change when you introduce them to LED aquarium lights. 15. How to program LED aquarium light? To effectively program your LED aquarium light, there is the need to read more about the process from the product manual. Most manufacturers will explain clearly how to do the programming with their respective LED light. If you lost your manual, you can still get the online copy to help you with the whole process of programming. With programming, you can easily identify the spectrum that will work better for day or night, and also what will be appealing to you. In other cases, you can choose when the LED can be turned on or off depending on the time of day. 16. 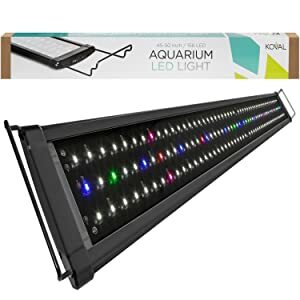 How much led light for an aquarium? The amount of LED lighting for your aquarium depends on the plants and animals you have chosen to grow and keep in it. For the easy plants, anything between 0.25 and 0.5 Watts per liter should be adequate to keep them working properly. In some cases, where you have the advanced plants, they are likely to require more than 1 Watt per liter. To optimize your lighting, make sure to have a good reflector in your tank. This should be able to help with better reflection and ensure that the temperature is well regulated in the aquarium. If high natural plant growth is being sought, you need to concentrate on PAR & PUR, not color mixes. A LED that utilizes natural noon time tropical sun emitters will do best for this. None of the lights listed here have a water proof rating of IP67, which is best for the wet aquatic environment. This is why none of these have a warranty past one year versus the best quality LED on the market with a rating of IP67 along with a 5 year warranty. what light is this that you speak of , do you have a link for said light ? No, color mixing with bulbs of different wavelengths is pretty standard for LED fixtures intended for photosynthesis, as far back as the “purple” grow lights for nurseries composed of blue and red diodes. Color mixing is used by some of the most reputable brands for coral and plant growth (AI, Kessil, Ecotech Marine). I highly doubt they could afford to continue with this method one generation after the next if they couldn’t grow what they were advertised to. How “natural” the plant growth they produce is anyone’s guess, they apparently do the job. Thank you for posting this article, and review. It helped me very much. Hello, I found this article very informative and useful, however I wish to build my own canopy for my fresh water aquarium. Check my products list and get the led aquarium lighting for type of your aquarium. I love how the title of this is currently “Best LED Aquarium Lighting – 2017 Reviews & Guide” and there’s comments from 2016. No mention of actual aquarium lighting units with waterproof ratings such as Aquaray tiles, Ecotech Radion fixtures or Kessil. The Current USA Orbit Marine Aquarium LED Light allows you to take the best care of your plant by manipulating different intensities of light and figuring out different growth phases for plants, hence creating the perfect environment. When figuring the wattage of LED bulbs if the bulb is listed as 13 watts , equivalent to a 100 watt incandescent bulb , is it 13 or 100 when you calculate your watts per gallon ? Or is there some in between calculation . How many 13/100 watt LED floodlights can you put on a 180 gallon tank to be at 4 watts per gallon max ? I cant find an answer anywhere I read . I know they are efficient , but does one 13 watt LED really exactly equal to a 100 watt incandescent bulb ? Current Orbit best priced and lighting is programmable. NOTE. Manufactures claim NOT to get the controllers or timers WET. Electricity and water Do Not Mix.